Rich and creamy STUFFED Baked Brie in Puff Pastry is a luxuriously, can’t-stop-eating, won’t -stop-pleasing appetizer with minimal effort! 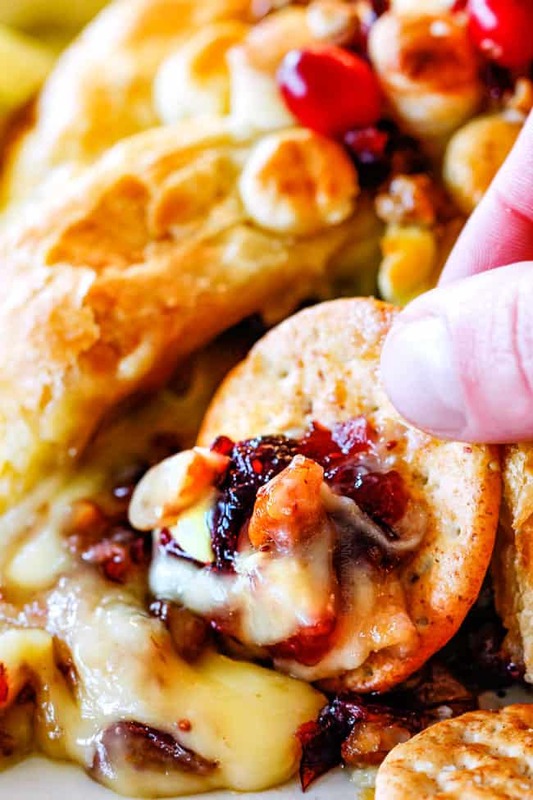 You are probably familiar with Baked Brie with Jam but this Baked Brie is stuffed with Pepper Jelly Cranberry Sauce, craisins and caramelized pecans! AKA it will disappear in a flash leaving nothing but guests clamoring for the recipe! This Bake Brie Puff Pastry recipe can also be prepped a day in advance then baked when you’re ready for company for stress free entertaining! Because you have enough to worry about this holiday season! Holiday appetizers are one of the most enjoyable reasons for the season in my book. 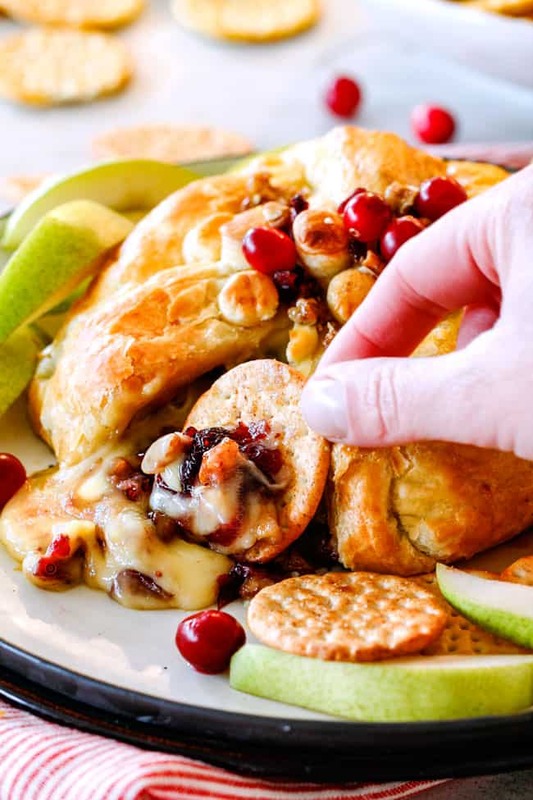 From Brie Spinach Dip, Cheesy Artichoke Dip Bites to Cranberry Pistachio Cheese Log to Cherry Cheesecake Dip and now a show stopping addition – Baked Brie in Puff Pastry! I’m so excited to bring you this Baked Brie in Puff Pastry because it is one of my favorite appetizers that just happens to be deceptively easy but looks impressively delicious. And it is impressively delicious. So delicious, I devoured almost half of the cheesy pastry just after I finished shooting. It’s just soooooooo good. Because really, what could be better than buttery, flaky pastry cocooning oozing, creamy brie bursting with Pepper Jelly Cranberry Sauce, craisins and caramelized pecans?! AKA the perfect bite of creamy, crunchy, salty, sweet and tangy. 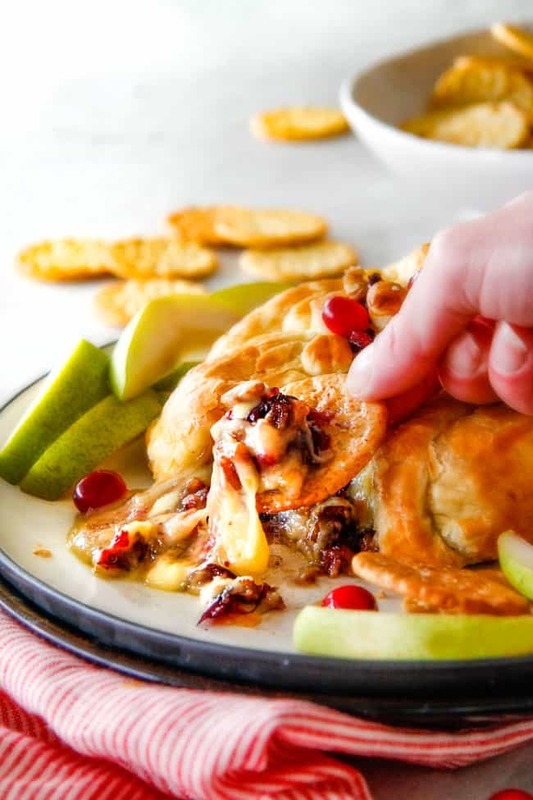 This decadent, savory crowd pleasing Baked Brie comes from our family tradition of a smorgasbord of appetizers on Christmas Eve and New Year’s Eve. One year my mom made a version of Baked Brie in Puff Pastry and it became a must every year after that. Christmas Eve couldn’t come fast enough – just for the baked brie. 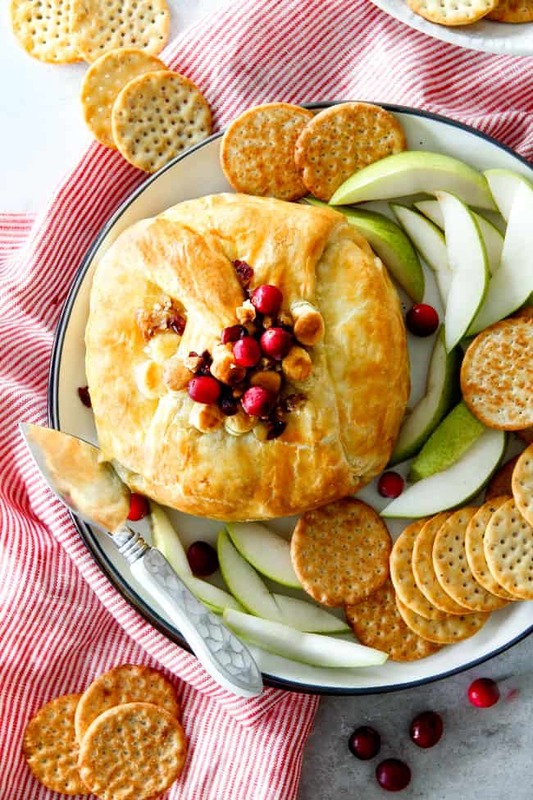 There are many variations of Baked Brie – some call for a smothering of jam and a sprinkling of nuts, others call for maple syrup, dried fruit and herbs while others call for caramelized onions. And while they are all delicious, because brie all on it’s own is the best melted cheese in. the. world, this STUFFED Baked Brie in Puff Pastry is my favorite version yet. Let me show you why! I used a 13.5 oz wheel of brie from Costco but don’t worry too much about the exact size of your brie. Everything in this recipe is flexible – you can use more or less ingredients. To make, first, we freeze our brie for 20 minutes to make it super easy to slice down the middle. 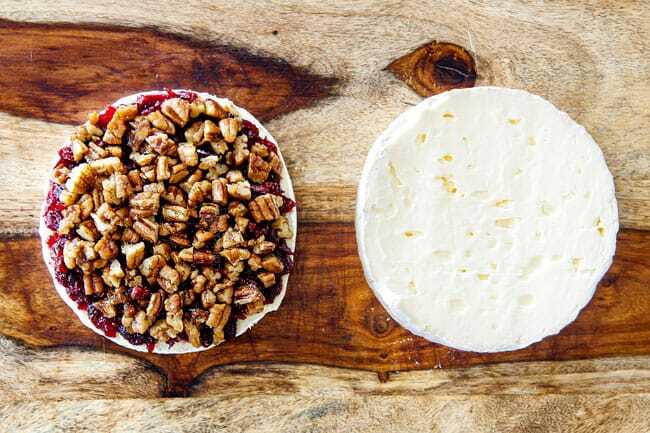 By creating two halves, we can stuff it with all our spectacular goodies which not only makes for a gorgeous presentation when the brie starts oozing out but creates an even distribution of yumminess. Next, we make our sweet heat Pepper Jelly Cranberry Sauce. This sauce is the star of the show. Aside from the brie of course. It’s sweet and spicy but not tooo spicy. It will taste quite spicy all on its own but remember we are sandwiching a layer in between our thick brie so it will be mellowed into the perfect compliment to the melty cheese. To make the Pepper Jelly Cranberry Sauce, simply add some Hot Red Pepper Jelly (which can be found in any grocery store with the jams/jellies), fresh cranberries, sugar and pineapple juice (or water) and simmer until thickened to jam-like consistency. You want the Sauce pretty thick so it sits snugly on the brie and delivers a punch of concentrated flavor. While our dynamic Pepper Jelly Cranberry Sauce is cooling, we caramelize and toast our pecans in 1 tablespoon butter and 1 tablespoon brown sugar. This is a super simple step yet it delivers enhanced nuttiness and caramelizaton that takes this Baked Brie to a whole new level. Now it’s time time to stuff our Brie! 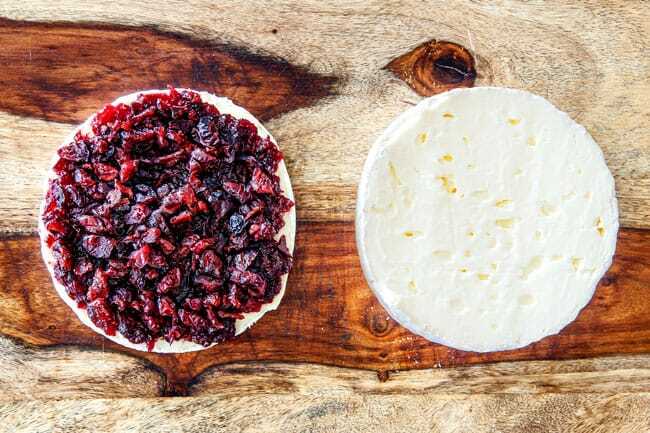 First, add a generous layer of Hot Pepper Cranberry Sauce to one of your cut brie halves. Next, top with chopped sweet craisins. Then top with our caramelized, now chopped pecans. Top the filling with the top piece of brie and set aside while we roll out our thawed sheet of puff pastry. If you haven’t used puff pastry before, it is a dream! It is located in the freezer section of your grocery store and is wonderfully easy to work with. It becomes beautifully golden and flaky once baked and is the ideal casing four our baked brie. We are going to lightly flour our work surface and puff pastry and roll it into a square approximately 11X11 inches. You don’t have to worry about a perfect square or the exact size because we are going to be cutting off the excess any way. Place the stuffed brie in the center of the rolled out dough then brush all around it with an egg wash that is simply one egg whisked with one teaspoon water. The egg wash will help our puff pastry stick to the brie, help the ends of the pastry stick together and help turn out pastry golden and shiny on the outside. Now, it’s time to wrap our brie up like a package. You want to take care that the puff pastry is tightly pulled over and that the brie is fully enclosed on top. To accomplish this, fold one edge of the dough over the brie. 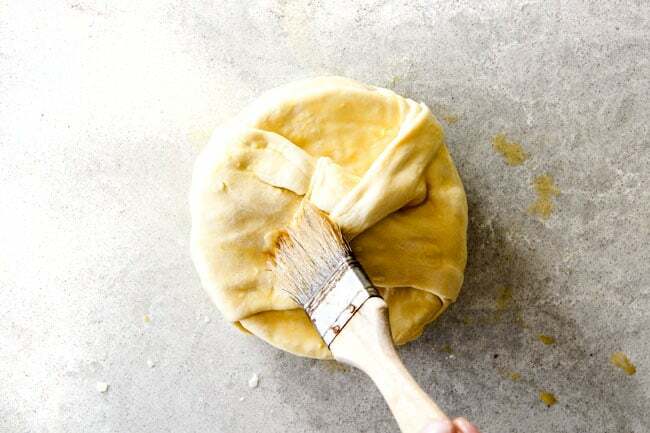 Fold up the opposite side then brush top dough with egg wash.
Repeat with the opposite edges until the brie is completely encased and trim off excess dough ends if necessary. Press the dough together to make sure it is snug and sealed all around. If you have excess dough from trimming the edges, you can create decorations to add to the top if you are feeling fancy. At this point, if you are making the Baked Brie in Puff Pastry a day in advance, place it in the refrigerator without brushing the exterior with egg wash. If you are making in advance but serving the same day, then brush the entire exterior in egg wash. An hour before serving, place the brie in the freezer for one hour – DON’T SKIP this step! In order for the pastry to be golden the same time the brie is melty, the pastry needs to be partially frozen when going into the oven. How long do you bake brie in puff pastry? Finally, place your brie on a piece of parchment paper and bake for 20-25 minutes OR until it is golden and you can see it leaking a little cheese. The brie will almost always leak through and then you can be certain the cheese is nice and melty through and through. Finally, let the Stuffed Baked Brie in Puff Pastry cool 10 minutes. This will ensure the brie is nice and melty but won’t gush everywhere or burn anyone’s mouth. What Goes With Baked Brie? crackers – so many to choose from, to mix and combine! Now go enjoy a new family tradition of rich and luxurious warm, melted brie bursting with sweet and tangy, nutty filling cocooned in golden, puffy, crispy pastry for years to come. Looking for more cheesy Holiday appetizers? 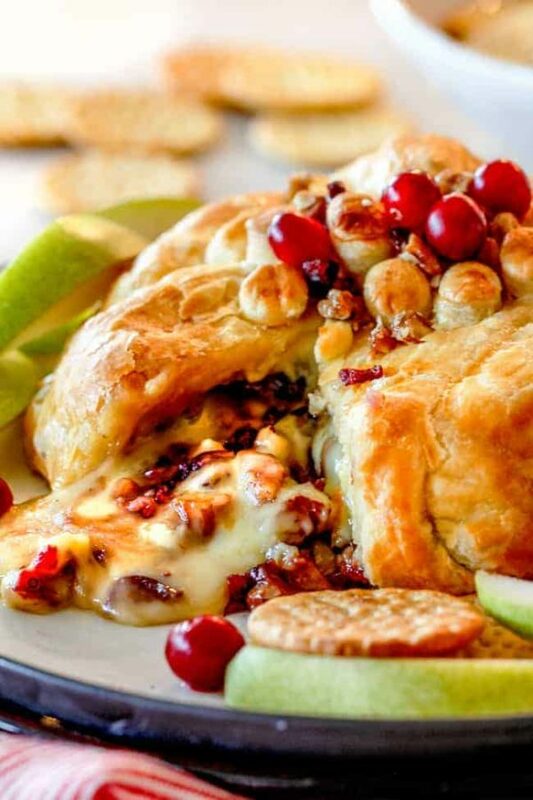 Want to try this Stuffed Baked Brie in Puff Pastry? Pin it to your APPETIZER, THANKSGIVING, CHRISTMAS, or HOLIDAY Board to SAVE for later! Rich and creamy STUFFED Baked Brie in Puff Pastry is a luxuriously, can't-stop-eating, won't -stop-pleasing appetizer with minimal effort! 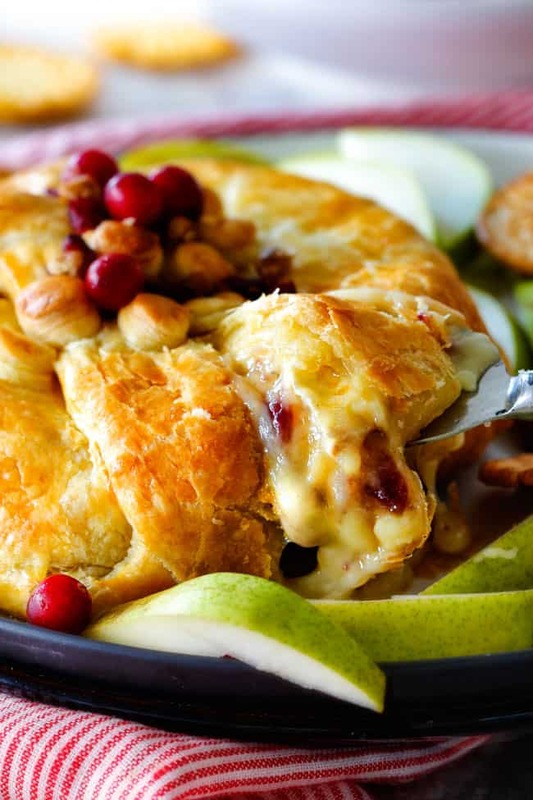 This Baked Brie will disappear in a flash leaving nothing but guests clamoring for the recipe! Remove pastry from freezer to begin thawing (it should take around 40 minutes – check package for thawing instructions). 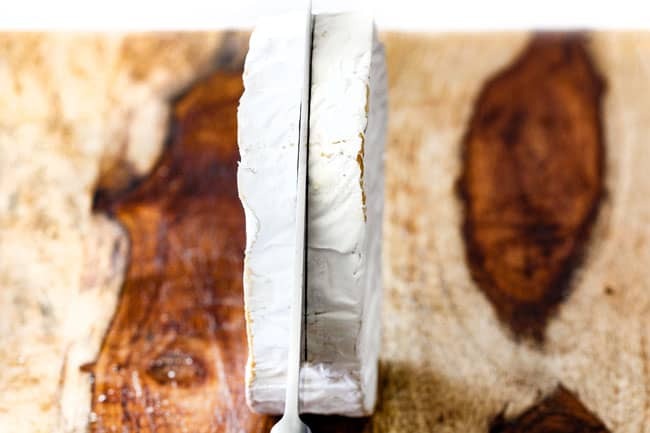 Freeze brie for 20 minutes to make slicing easier. After brie has been in the freezer 20 minutes, remove and slice equally through the equator. 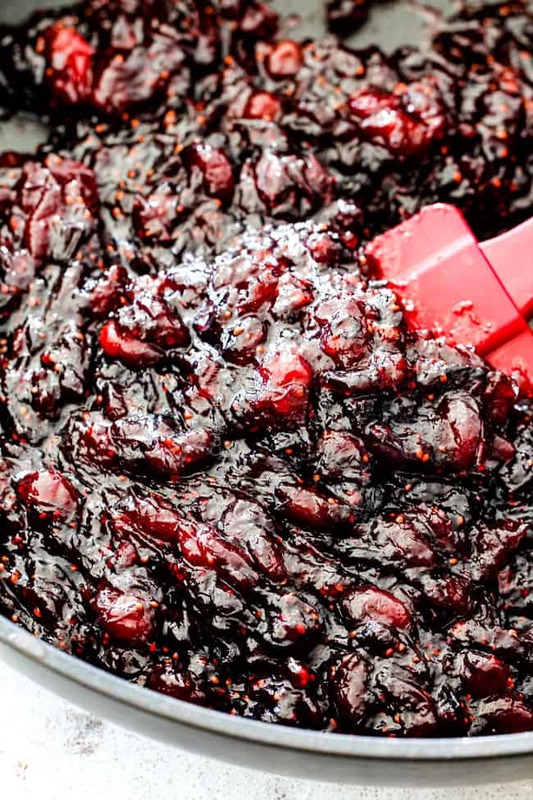 Add all of the Pepper Jelly Cranberry Sauce Ingredients to a medium saucepan and bring to a boil. Reduce heat to medium-low, and simmer, stirring often, until thickened (you want it quite thick). Remove from heat and allow to cool to room temperature (you can refrigerate to speed up the process). Meanwhile, melt butter with brown sugar in a medium skillet over medium heat. Add pecans and cook, stirring often until golden, about 2-3 minutes. Transfer to parchment paper until cool enough to chop. Lay the two brie halves next to each other, cut side up. Spoon a generous amount of Cranberry Sauce over the left piece of brie (approximately 1/4-/1/3 cup) and spread into an even layer (you might not use all of the sauce). Evenly top with chopped craisins followed by chopped pecans. Top the loaded brie with the right piece, cut side down so the rind is on the outside. Set aside. Lay thawed puff pastry sheet on a lightly floured surface and lightly dust with flour. Roll into a square approximately 11x11 inches. Place stuffed brie in the center of the puff pastry. Brush egg wash on puff pastry all around brie. Fold one edge of the dough over the brie and brush the top with egg wash. 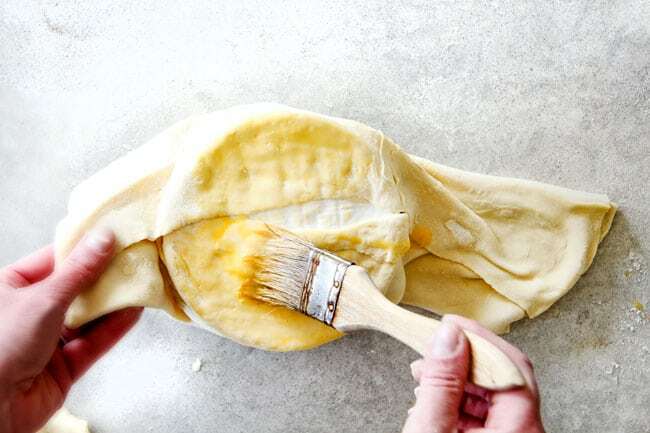 Fold up the opposite side then brush top dough with egg wash. Repeat with remaining edges until the brie is completely encased, trimming off excess dough edges if necessary. 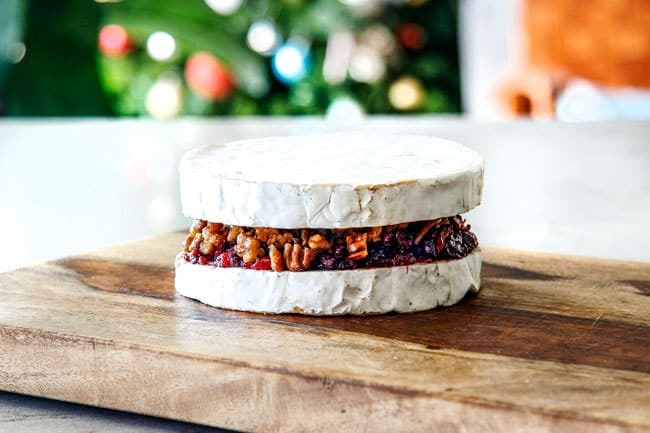 You can use excess dough to make decorations to place on top of brie if desired. Press the dough together to make sure it is snug and sealed all around. Brush the top and sides of the wrapped brie with egg wash.
Place the brie in the freezer for one hour – DON’T SKIP this step! After 45 minutes, preheat oven to 425 degrees F. Line a rimmed baking sheet with parchment paper. Place the brie on the prepared baking sheet and bake for 20-25 minutes OR until it is golden and you can see it leaking a little cheese. Let cool 10 minutes before servings with crackers, fruit, etc. 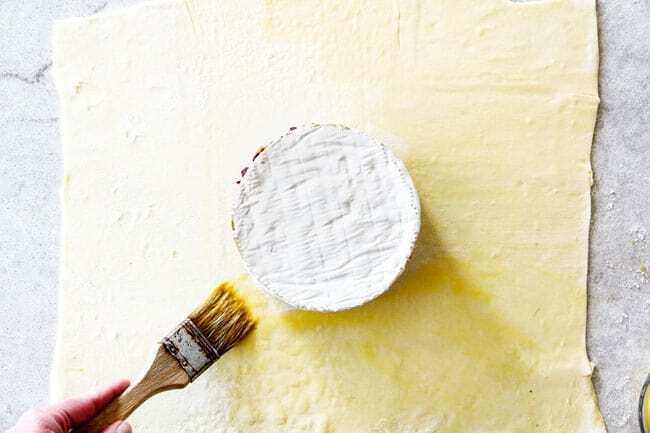 The brie can be wrapped in pastry WITHOUT brushing the exterior in egg wash and kept refrigerated for up to a day. When ready to make, brush with egg wash, freeze for 1 hour and bake as directed. I have always wanted to make baked brie with puff pastry but have been too intimidated but I am definitely going to try your recipe! The filling sounds incredible and easy too! Thanks Jen, I know it will be another winner! I am so excited for you to try it Natalie, I think it’s going to become a new favorite! Can’t wait to hear what you think! I am so excited to make this for Christmas Eve! 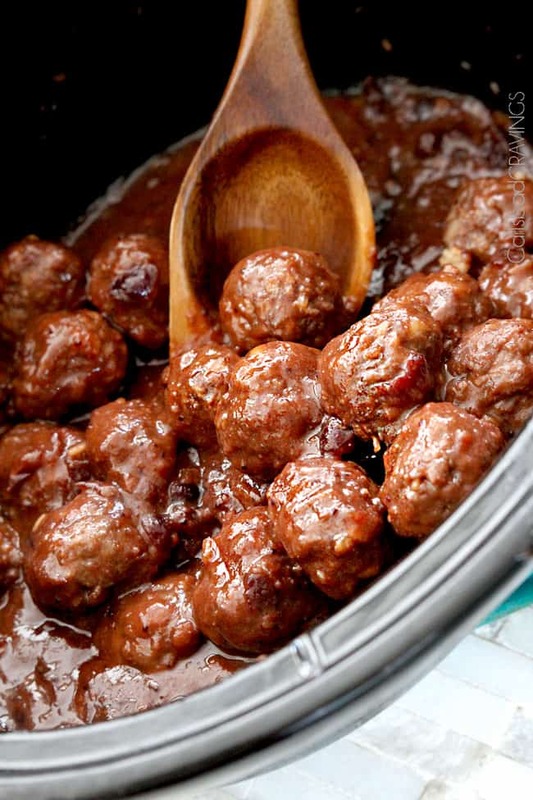 I know my family is going to love it along with your already famous Cranberry Meatballs! Merry Christmas! Hi Jordan, I’m so happy to hear you love my Cranberry Meatballs and are going to try this recipe as well – yum! I hope you love as much as us! Merry Christmas! This looks absolutely fantastic to me. I always have a soft spot for savory dishes, especially ones that are a little bit unusual – as yours certainly is. Thanks Vince, savory are my fav – especially with cheese! I also found it easy to put together yesterday and then bake right before the party. Thank you so much for your awesome comment Stacey! I’m thrilled it was a huge hit without a bite left – the ultimate compliment 🙂 And thank you for the make and bake later tip – I’ll add that to the notes! You are so welcome! I LOVE hearing it was annihilated :)! Happy 2019! So I tried to make this. It’s cooling as we speak before we cut it open. I can’t wait to try it. Quick question, the pastry started ripping as I was transporting it from the plate in the freezer to the baking tray.. And some of the jelly juice started dripping out. Not sure how to avoid this for the future? Any thoughts? HI Joanne, I hope you loved it! You can freeze it on the baking tray itself so you don’t have to transfer it – that’s the only thing I can think of other than being super careful. You can also patch up any tears before baking. Hope that helps!